I still remember my excitement when I heard an Atari console would be released to the public. The 64-bit craze was in full swing as manufacturers claimed their consoles were genuine 64-bit while competitors were not. I didn't care - I wanted a new Atari! A buddy and I skipped out of work long enough to hit up Nobody Beats the Wiz (remenber them? a now-defunct electronics retailer in the Metro NY area), since Crazie Eddie had gone under in 1989, long enough to score a Jaguar. We drove back to the office and opened it up to drool over it's Atari beauty. The Atari Jaguar was a video game console released by Atari Corporation in 1993, it would be the last to be marketed by Atari. It was designed to surpass the Mega Drive/Genesis and the Super Nintendo Entertainment System in processing power. It was in competition with 3DO and later consoles that made up the Fifth generation of video game consoles. The console was first released in selected U.S. cities in November 1993, and the rest of the country in early 1994. Although it was promoted as the first 64-bit gaming system, the Jaguar proved to be a commercial failure and prompted Atari to leave the home video game console market. Despite its commercial failure, the Jaguar has a dedicated fan base that produces homebrew games, making the console a cult classic. The Jaguar was developed by the members of Flare Technology, a company formed by Martin Brennan and John Mathieson. 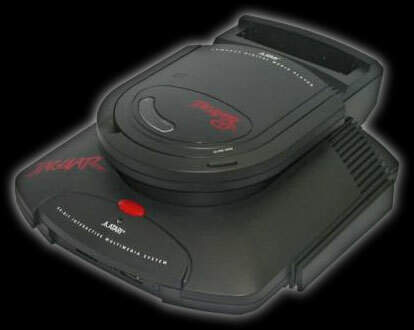 The team had stated that they could not only make a console superior to the Sega Mega Drive (also called the Sega Genesis) or the SNES, but they could also be cost-effective. Impressed by their work on the Konix Multisystem, Atari persuaded them to close Flare and, with Atari providing the funding, to form a new company called Flare II. Flare II initially set to work designing two consoles for Atari Corp. One was a 32-bit architecture (codenamed "Panther"), and the other was a 64-bit system (codenamed "Jaguar"); however, work on the Jaguar design progressed faster than expected, so Atari Corp. canceled the Panther project to focus on the more promising Jaguar. The Jaguar was introduced in November 1993 at a price of $249.99, under a $500 million manufacturing deal with IBM. The system was initially marketed only in the New York City and the San Francisco Bay areas, under the slogan "Do the Math", claiming superiority over competing 16-bit and 32-bit systems. A nationwide release followed in early 1994. Initially, the system sold well, outselling the US$700, highly hyped and publicized 3DO, which was also released during the holiday season of 1993, and a nationwide release followed. But the Jaguar proved unable to sustain sales momentum past the holiday season and the 3DO would eventually outsell the Jaguar. Among the factors contributing to forestalling sales: lackluster gaming library, due to poorly received launch titles; and Atari's history from its decade earlier 2600 console, which irreparably tarnished the firm's reputation in the eyes of retailers and would-be customers. Jaguar did earn praise with titles such as Tempest 2000, Doom, and Wolfenstein 3D. The most successful title was Alien vs. Predator. Both it and Tempest 2000 are often considered the system's defining titles. With such a small library of games to challenge the incumbent 16-bit game consoles, Jaguar's appeal never grew beyond a small gaming audience. Customers also complained the Jaguar controller was needlessly complex, with over 15 buttons. The controller was ranked the worst video game controller ever made by IGN editor Craig Harris. Lack of titles was attributable to two main factors: the Jaguar's questionable long-term prospects among third-party game-publishers, and the problematic nature of developing games for the Jaguar. Atari had one opportunity to convince third-party developers, vital for the diversity of Jaguar's game library, with a solid retail-performance, but as things played out, post-holiday sales figures questioned the viability of Atari's business; merely outselling the niche 3DO-system (which cost almost three times as much as the Jaguar) failed to attract third-party developers already committed to other game platforms. In addition, the Jaguar's underlying hardware was crippled by a flaw in the CPU's memory controller, which prevented code-execution out of system RAM. Less severe, but still annoying defects included a buggy UART. The controller flaw could have been mitigated by a mature code-development environment, to unburden the programmer from having to micromanage small chunks of code. Jaguar's development tools left much to the programmer's imagination, as documentation was incomplete. Writing game-code was often an endurance exercise in the tedious assembler. In a July 1995 interview with Next Generation Magazine, then-CEO Sam Tramiel declared that the Jaguar was as powerful, if not more powerful, than the Sega Saturn, and slightly weaker than the Sony PlayStation. Atari had already suffered an ill-fated crash in the mid 1980s as a result of the oversaturation of the video game market by third-party developers. Production of the Jaguar ceased after Atari Corp. merged with JT Storage in a reverse takeover.In a last ditch effort to revive the Jaguar, Atari Corp. tried to play down the other two consoles by proclaiming the Jaguar was the only "64-bit" system. This claim is questioned by some, because the CPU (68000) and GPU executed a 32-bit instruction-set, but sent control signals to the 64-bit graphics co-processors (or "graphics accelerators"). Atari Corp.'s position was that the mere presence of 64-bit ALUs for graphics was sufficient to validate the claim. Design specs for the console allude to the GPU or DSP being capable of acting as a CPU, leaving the Motorola 68000 to read controller inputs. In practice, however, many developers used the Motorola 68000 to drive gameplay logic. Over the short life of the console, several add-on peripherals were announced. However, only the ProController, the Atari Jaguar CD drive and the JagLink (a simple two-console networking device) reached retail shelves. A voice modem and VR headset (with infrared head-tracking), existed in prototype form, but were never commercialized. After the Atari Corporation properties were bought out by Hasbro Interactive in the late 1990s, Hasbro released the rights to the Jaguar, declaring the console an open platform and opening the doors for homebrew development. A few developers, including Telegames and Songbird Productions, have not only released previously unfinished materials from the Jaguar's past, but also several brand new titles to satisfy the system's cult following. Atari Games licensed the Atari Jaguar's chipset for use in its arcade games. The system, named COJAG (for "Coin-Op Jaguar"), replaced the 68000 with a 68020 or MIPS R3000-based CPU (depending on the board version), and added a hard drive and more RAM. It ran the lightgun games Area 51 and Maximum Force. Other games (3 On 3 Basketball; Fishin' Frenzy; Freeze; Vicious Circle) were developed but never released. Blitter - 64-bit RISC architecture; high speed logic operations, z-buffering and Gouraud shading, with 64-bit internal registers. Motorola 68000 "used as a manager." Released in 1995, the Memory Track is a cartridge that contains a 128K EEPROM, allowing Atari Jaguar CD games to save persistent data such as preferences and save games.